Her Adopted Son, this Norman Rockwell painting, appeared on the cover of Life Magazine published May 30, 1918. An alternate title for this picture is Soldier in European Home. This was the seventh cover by Rockwell to appear on Life Magazine. A Rockwell illustration appeared on the Life magazine cover a total of ten times in 1918 and twenty-eight times in all. Norman Rockwell painted this picture of an American soldier being welcomed and accepted into a European home. 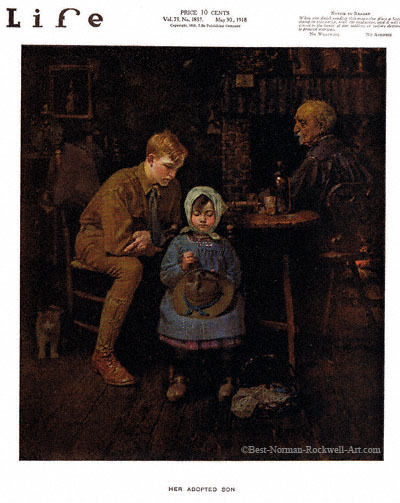 The little girl in this painting is mending the hat of the American soldier. From our vantage point, we can not see why it needs repairing. This little girl is concentrating very hard, though, as is the soldier was her son. The soldier, for his part, is intensely watching the girl sew on the hat. Perhaps he is taking mental notes, trying to learn how to sew. Possibly this is the same soldier featured on the June 13 Life cover. Maybe he did learn to sew after all. The girl's father or, more likely, her grandfather is also pictured in the painting. He is enjoying a glass of wine by the fire. He is also amused by the scene unfolding in his dining room. He appears to be watching the soldier learning to sew. The only character in the picture looking at us, the audience, is the family cat. Rockwell painted very few European home scenes without a pet of some kind, usually a cat. Rockwell painted his ideas as real as possible, so we can safely assume that a cat in the home was the norm in World War One Europe.